The EcoHitch is one of only a handful of options available for our low volume Ford Focus EV. I knew I wanted something that required no cutting to install and would be low profile enough to be largely unnoticeable when not in use. 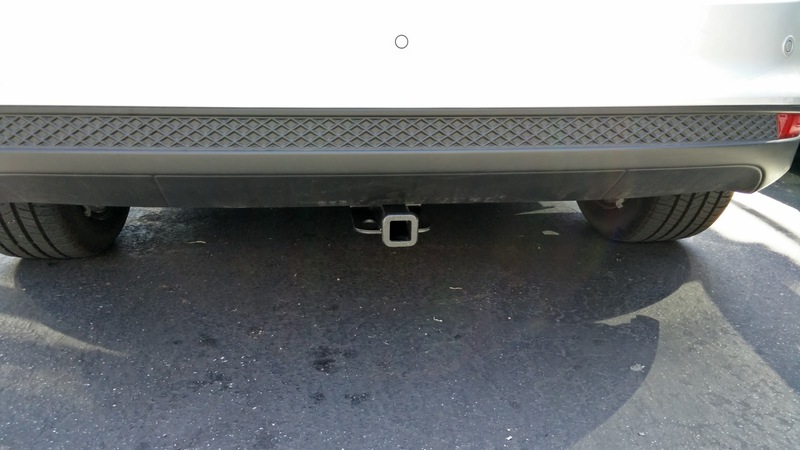 Reviews from owners of other vehicles with the EcoHitch installed appear to be overwhelmingly positive so I figured that it was a pretty safe bet. Of course, Torklift Central does not list the EcoHitch as being compatible with the 2014 Focus EV and a phone call to their help line was unable to provide me confirmation of fit, so I bit the bullet and made the purchase anyway, relying on my understanding that my 2014 model was fundamentally the same as the 2012 and 2013 models that came before it. 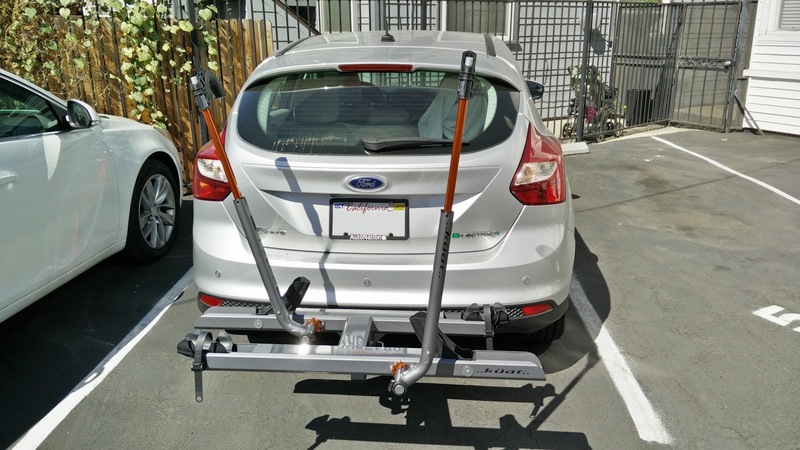 About a week later, I got the notification in my email that the EcoHitch had been delivered to my certified installer of choice, Rack N Road in Orange County. I scheduled an appointment to bring the car down and have them install everything. 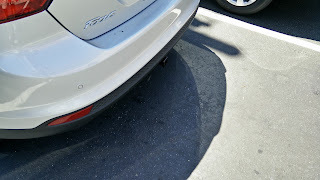 On the appointed date at the scheduled time, I dropped the Focus off at the shop, wandered down the street for a leisurely lunch, and returned to find my car fitted with the nearly totally hidden hitch. Looking at the hitch itself, the material quality seems to be excellent and a lot of care went into making sure that the paint on it was thick and well hardened to prevent little nicks from exposing the bare metal. From what I could see of the welds, they were smooth and even, looking like very good quality work. 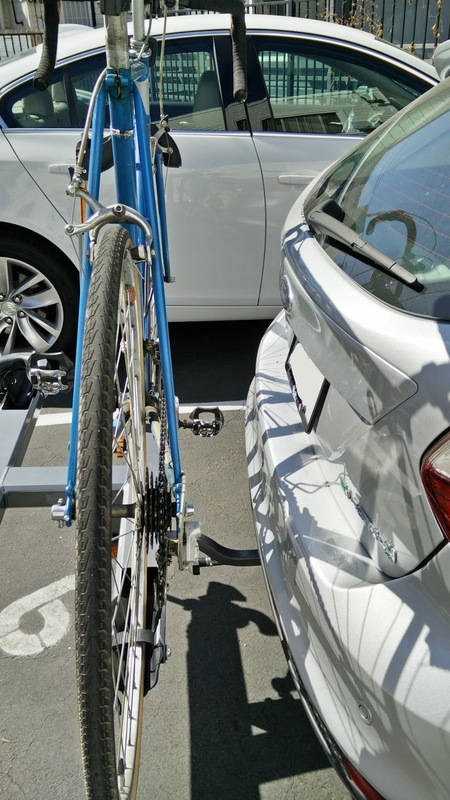 Standing behind the car, the hitch is visible, but not so noticeable as to be distracting. From most angles, the hitch receiver is barely even noticeable and does not stick out beyond the plane of the rear edge of the bumper. Overall, I am extraordinarily pleased with the results and the added versatility. 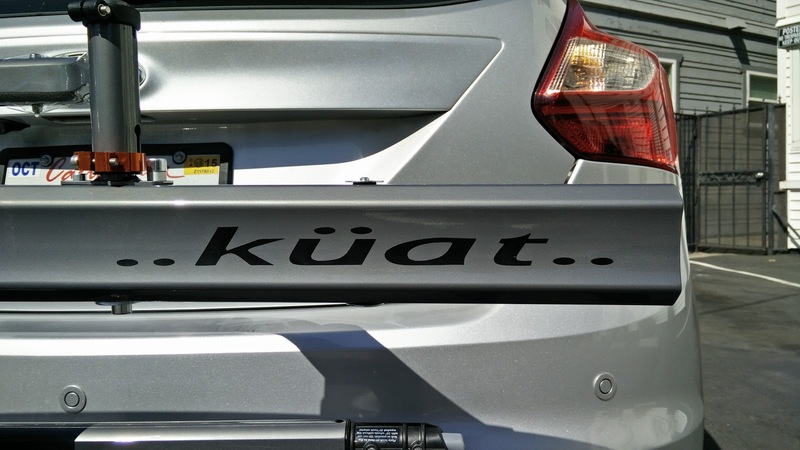 After getting the car home, I immediately went inside and brought the Kuat Sherpa, which I had ordered weeks earlier and had already assembled. The included instructions could use a bit more clarity, but the fact that they included all of the necessary tools to complete the assembly along with a nice little bag to hold all of the tools and spares is a great touch. Before I started putting things together, I noted that the construction of the rack is really quite impressive. The paint is glossy and free of aberrations while the anodized orange pieces look great and really pop against the gunmetal gray. Even the plastic components feel heavy duty and should be able to withstand a tremendous amount of wear. 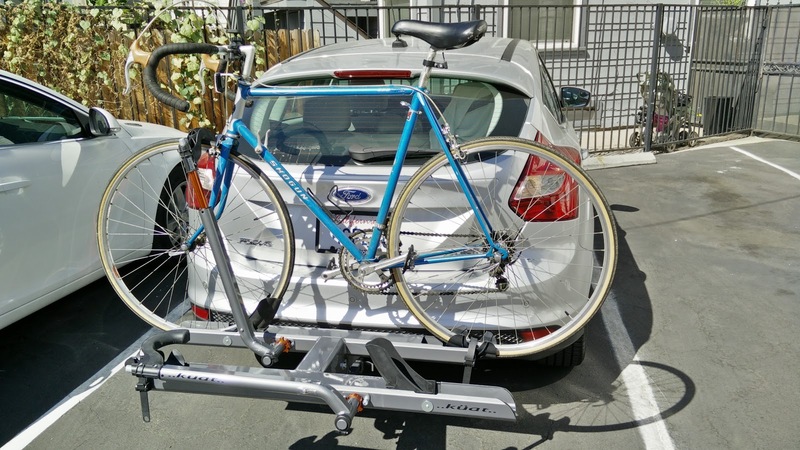 Installing the rack could not be easier. I slide the neck of the rack into the receiver and insert the hitch pin to help align it correctly. 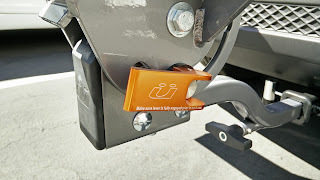 A quick tug back to tighten the rack against the hitch pin keeps everything nice and tight allowing me to lock the hitch pin in place, which prevents the opportunists from stealing the rack. Then, using the handle at the end of the neck, I use the Kuat cam lock system to tighten the rack in the receiver until there is absolutely zero movement whatsoever. When installed properly, the Sherpa is solidly connected to the car. In fact, by rocking the rack, I could see the car move slightly on its suspension, a good sign of just how solid this attachment mechanism is. Before doing anything else, I checked the clearances. 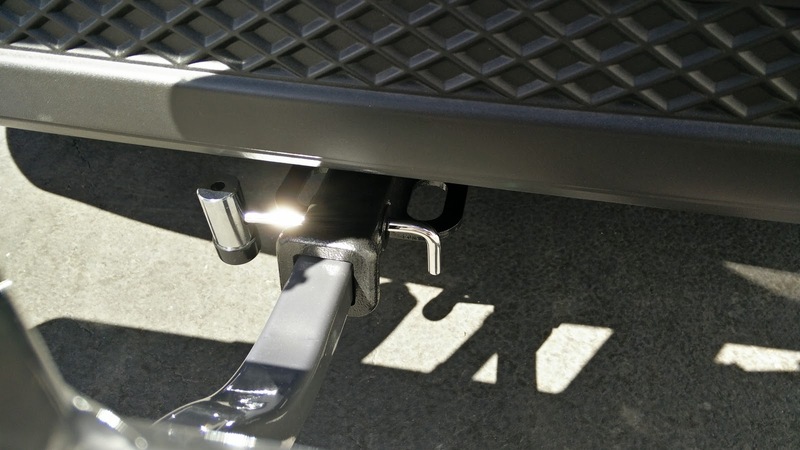 Since the end of the hitch is essentially aligned to the edge of the bumper, there is plenty of space between the rack and bumper in both the up position for storage and down position for use. With the rack in the stored position, I was able to open up the hatch with room to spare and no danger of the hatch making contact with the rack. This was one of my biggest concerns so the fact that everything checked out fine was a huge relief. Next step, pull out one of my bikes and properly test the ease of use. This is another area where the Kuat Sherpa shines. One lever is all it takes to lower the rack from its storage position. Everything moves with a fluidity that demonstrates the rack's quality construction. There are no snags anywhere as I move the arms into position and unlatch the wheel straps. With the relatively low hitch height of my Focus EV, the lift-over height to place a bike on the rack is quite low and easy to do without straining. 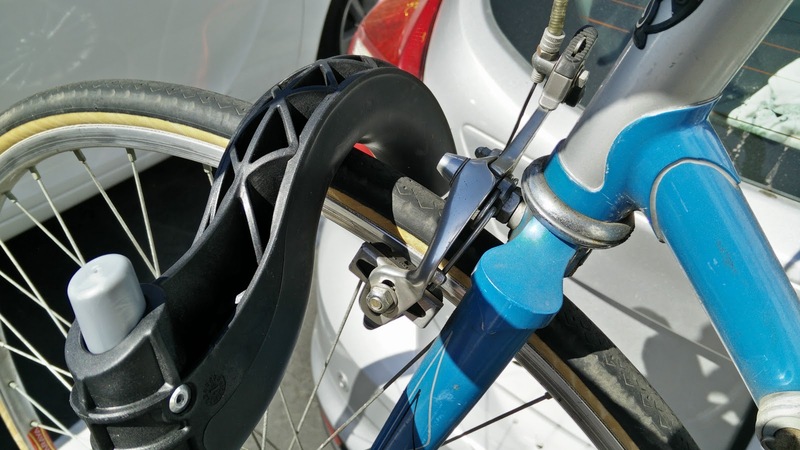 My vintage Shogun road bike fit easily into the front wheel stand and the rear wheel cup adjusted easily into place. Pull the arm in place as close to the fork and front brake caliper and press down until the bike is secured. Tighten down the rear wheel strap and the bike is nice and solidly held in place. I shook the bike to see if it would move around at all and, once again, the entire car bounced up and down a bit on the suspension. That kind of reassuring solidity makes me comfortable with the idea of sticking my carbon road bike on the rack. A great feature of the Kuat Sherpa is the ability to tilt the entire rack away when loaded to allow access to the rear cargo area. Once again, clearance was a potential concern so with the bike loaded, I tilted the rack down and popped the hatch. Carefully, I lifted the hatch and checked the couple of pinch points, particularly the handlebars pedals and handle bars and everything cleared without issue. 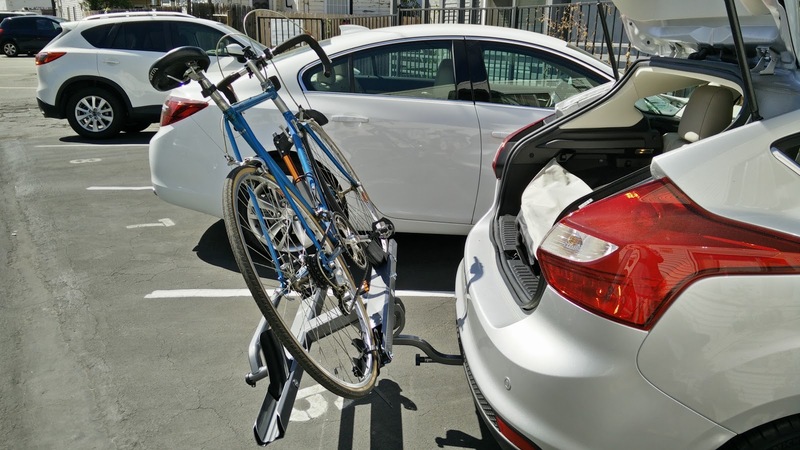 Now, your experience with this rack might vary depending upon your bike and car, but at least for me, with the EcoHitch on the Focus EV, everything works brilliantly. About the only thing I can fault with the Kuat Sherpa rack is the choice of locking mechanism. They include a medium weight coated cable that you loop around the bikes and lock to the hitch pin. While this will probably work okay for deterring the opportunist, it is probably the least secure option. 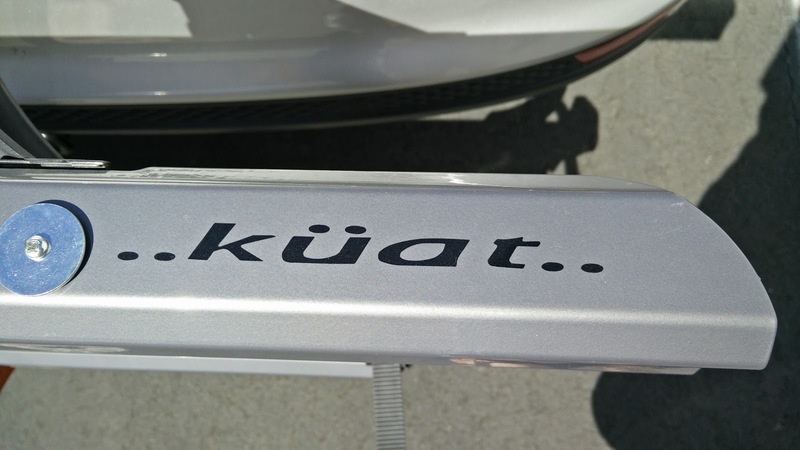 I would love to have seen the more sophisticated cable locking mechanism on the Kuat NV or, even better, a locking ratchet release button on the rack arm. Still, considering the versatility and ease of use that the rack offers, this is a minor fault in the grand scheme of things. This combination of the EcoHitch and Kuat Sherpa should provide worry free bike carrying for years to come. So far, I have only used it a few times, mostly to transport bikes back and forth between my apartment and our families' homes on weekends, but the added weight seems to have little to no penalty on the performance or range of the Focus EV. Even with the bike on the back, the entire assembly is almost entirely protected from the wind by the shape of the Focus's hatch. Watching the bikes through the rear view mirror, no odd motions are visible and everything looks solidly affixed, as if it was always intended to work so well. In all honesty, I am not sure I could have picked a better combination of accessories to help enable my biking habit.